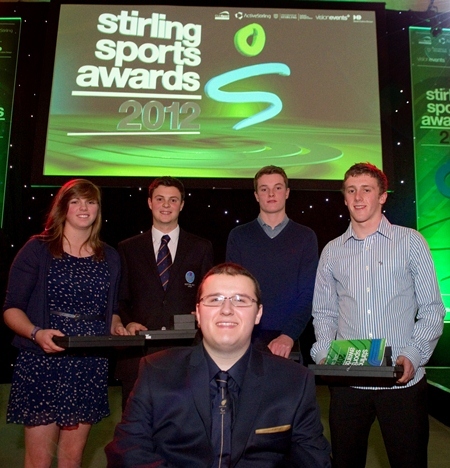 Sporting talent from the University of Stirling gained regional recognition at the Stirling Sports Awards last night. Golfer Jack McDonald picked up prize for the Student Athlete of the Year whilst triathlete Grant Sheldon won the Inspirational Student Performance of the Year at the Awards held at Stirling Castle. The annual awards, delivered by Active Stirling and ClubSport Stirling in partnership with the University, rewarded the athletes, coaches and clubs contributing to the city’s sporting success in 2012. McDonald, a Mathematics student, pipped World Junior triathlon competitor Marc Austin and London 2012 paralympian Scott McCowan to the coveted student award. The 19-year-old is now No.1 Scot in the World Amateur Golf Rankings after a phenomenal season saw him gain his first senior international cap and help Scotland to win the Home Internationals. He also reached the British Amateur Championship semi-final and competed at two professional European Tour events, including the Scottish Open where he finished as the highest-placed amateur, playing alongside Ernie Els. In student competition, McDonald won the British Universities Championship and collected a silver medal for Great Britain at the World University Golf Championships. Sheldon, 18, also studying Mathematics, collected the Inspirational Performance Award for his mental strength to recover from recent injuries and return to top-level competition. The Scotland and Great Britain Junior international suffered a serious bike crash during the 2011 European Junior Championship final then, after fighting back to qualify for the same event a year later, a training injury put paid to his hopes of a medal finish. Undeterred, the Hamilton triathlete showed his battling qualities returning to competitive action ahead of schedule and recorded several impressive results including a top-10 placing at a European Cup race. Sheldon will have been boosted by the feats of Stirling Sports Awards special guest Alistair Brownlee, who himself overcame a serious injury to win the London 2012 Olympic triathlon gold medal. David Lavallee, Head of the School of Sport at the University, said: “We are very fortunate in this great city to benefit from fantastic sports facilities and by the fact we adopt a collaborative approach to make the most of every sporting opportunity. The Stirling Sports Awards are a fantastic way to pay tribute to the great sporting talent across Stirlingshire and I would like to extend my congratulations to all the winners and nominees. Tennis ace Andy Murray – who used to practice with students at the University – won the Sports Person of the Year Award, whilst University graduate Kerry Wood was shortlisted for the Run4 It Club Coach of the Year for her work with the University and Stirling Swimming Club.